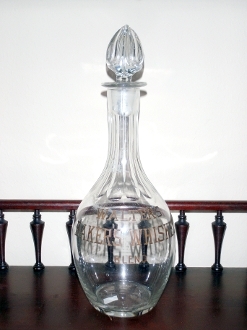 Walters Baker's Whiskey Blend back bar bottle with gold embossed letters. Bulb shaped bottle with cut fluted neck. Bottle stands 9 1/2" alone and 11 1/2" with stopper. Interior has some residue. Stopper bottom has some chipping. Nice bottle.